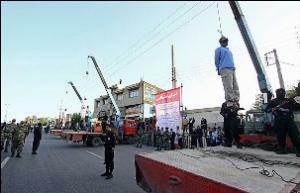 No more death penalty but still hundreds of thousands in prision for non-violent drug offenses: both Iran and the US. But on a more hopeful note, the US seems to be moving slowly toward legalizing marijuana and may eventually treat drug addiction as a medical rather than criminal problem. Perhaps someday the US might even provide help for those who are mentally ill rather than imprisoning them. Iran's policy shift in contrast to the U.S. Still like the USA 70% of Iran's prison population consists of some 250,000 non-violent drug offenders. They also have one of the highest opioid addiction rates in the world bordering the country responsible for 95% of the world supply Afghanistan. They may not be killing as many but until countries like the USA and Iran treat addiction as a medical issue and not a criminal violation we both remain mired in wasteful ineffective programs and the dark ages of government policy on drugs! "Just say no"didn't work for Nixon's wife . How the f$%k was it supposed to work for an entire nation!